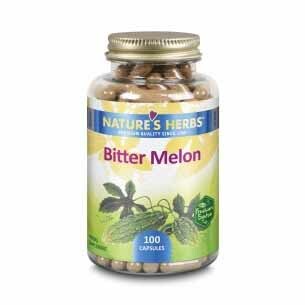 Nature’s Herbs Premium Quality Bitter Melon is cultivated throughout the tropical regions of the world. A delicate vine, it produces beautiful flowers and prickly fruit and is often eaten as a vegetable. Bitter Melon, also known as Karela, takes its botanical name from the Latin verb, momordi, which means to bite. This is in reference to the seeds, which are said to resemble teeth. Do not use if you are pregnant or nursing. Not for use by men or women trying to conceive. Consult a health care professional before use if you are taking any medication or have any medical condition. KEEP OUT OF REACH OF CHILDREN.